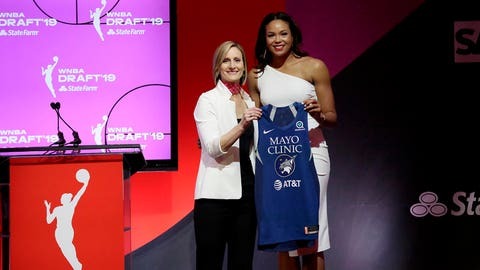 The Minnesota Lynx selected former Connecticut forward Napheesa Collier with the sixth pick of the 2019 WNBA draft, the team announced Wednesday. Collier, a 6-foot-2 forward, is coming off a senior season in which she developed into a double-double machine. She averaged 20.8 points and 10.8 rebounds per game, picking up 25 double-doubles on the season, including eight straight to close out her collegiate career. Collier is one of five Connecticut players to finish her career with 2,000+ points and 1,000+ rebounds. She made four Final Four appearances with the Huskies and brought back a national title in 2016. Minnesota will need her to step into a big role this season. Maya Moore is taking the year off to focus on family and ministry, and point guard Lindsay Whalen, another key piece to the Lynx’s dynasty run from 2011-17, hung up the sneakers after an illustrious 15-year career. Elsewhere in the first round of the draft, former Notre Dame guard Jackie Young was selected first overall by Las Vegas. She was followed by Louisville’s Asia Durr (New York Liberty), Mississippi State’s Teaira McCowan (Indiana) and Connecticut’s Katie Lou Samuelson (Chicago). Dallas used the fifth overall pick to select Notre Dame guard Arike Ogunbowale.